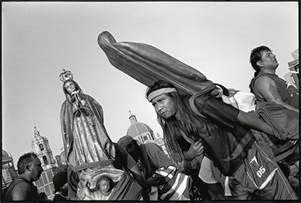 Ralph Burns Festividad de Nuestra de Guadalupe #1, Gelatin silver selenium toned FB print, 14 x 11 inches. Courtesy of the artist. On Saturday, March 29, the Asheville Art Museum is thrilled to be hosting an opening reception for local photographer Ralph Burns’s exhibition, Ralph Burns: A Persistence of Vision — Photographs 1972-2013. Burns has long been recognized as a documentary photographer whose images have captured the diverse and enigmatic nature of ritual and religion, and who has explored the subjective and often defining nature of belief, worship and culture. Like his predecessors — such as Walker Evans, Diane Arbus, Mary Ellen Mark and Robert Frank — Burns uses his cameras to probe a constantly shifting human landscape and to document the public and private aspects of culture and religion in transition, often working at the unclear and overlapping intersection of both. Throughout his career Burns has displayed a continuous and persistent interest in the motivations for worship and ritual while maintaining a compassionate and non-judgmental intimacy with his subjects. He has photographed both collective and individualized manifestations of what he sees as a seemingly irrepressible human need to ritualize loss, love and death, and to formally externalize and codify hope and the desire for transcendence. The photographs in A Persistence of Vision illuminate Burns’s concerns and interactions: an Elvis fan seemingly keeping vigil over a blanketcovered, bed-ridden Elvis icon in Memphis; a penitent in Mexico carrying the statue of Our Lady of Guadalupe, strapped awkwardly to his back; a man staring hard into the distance while being prayed over for healing at a Marion apparition site in Georgia; a woman in agonized ecstasy struggling with being baptized in the Jordan River in Israel. This is Burns’s second solo exhibition at the Asheville Art Museum, his first being in 1990. His work has also been included in a number of group exhibitions at the Museum and is included in the Museum’s Permanent Collection. Ralph Burns: A Persistence of Vision — Photographs 1972-2013 is a broader and more extensive survey of Burns’s work over the past 40 years and, although centered on his images of religion, ritual and belief, is not limited to those subjects.